Spring fishing has picked up in Galway over the last couple of weeks, with some nice spring salmon landed by anglers. Water levels have been slowly dropping, with one gate now open, providing superb opportunities for fly anglers in particular. Renowned fly angler and proud Waterford man Mossy Browne landed a nice 9lbs springer on the fly, while former Erriff fishery manager Jim Stafford took a 10lbs fish, also on fly. 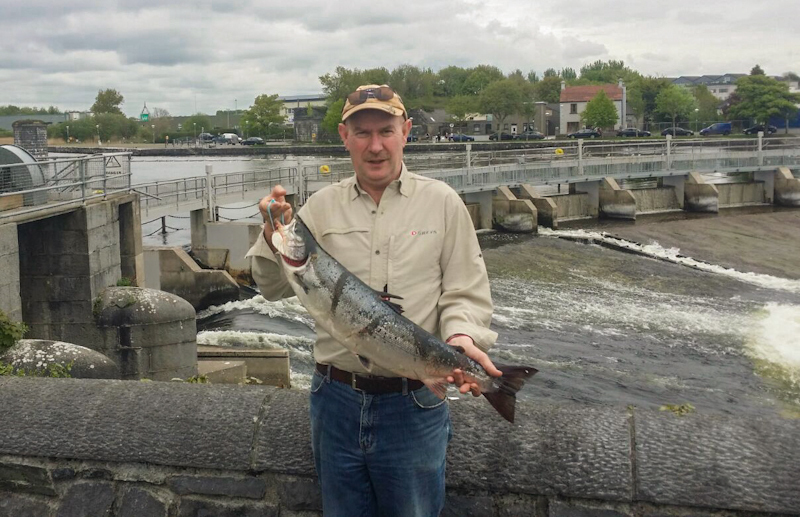 Westmeath man Gary Kilroy fished the spinner and landed a 10bs fish, while Northern Irish visitor Davy McMurtry had a fine 14lbs salmon, also on spinner. Fellow Northern man Davy Hoy fished the fly and landed an 11.5lbs springer, while No. 1 Dubs supporter Colm Adams had an 11lbs fish on spinner. Fellow Dub Leo Casey took a 9lbs fish on fly, while Kildare and Dublin men Sean McManmon and Paddy Murray had a successful visit, landing 3 salmon on the fly over 2 days, including fish of 10 and 11.5lbs for Sean, and a 7lbs fish for Paddy. Portlaoise man Billy Moylan landed a fine 13lbs salmon on spinner, and Clifden angler Ashley Mathews had a 10lbs fish on fly, while Limerick man Martin Kiely had a 9.5lbs fish on shrimp. Leo Casey with his 9lbs salmon caught on fly in Galway, 23 April 2017. 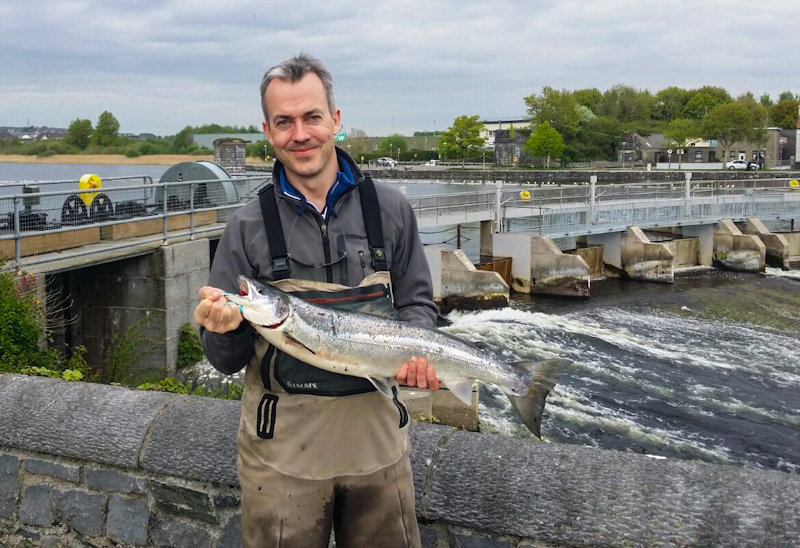 With more fresh fish being seen every day now, and water levels coming into better condition, fishing prospects for the rest of the spring run look pretty good in Galway. 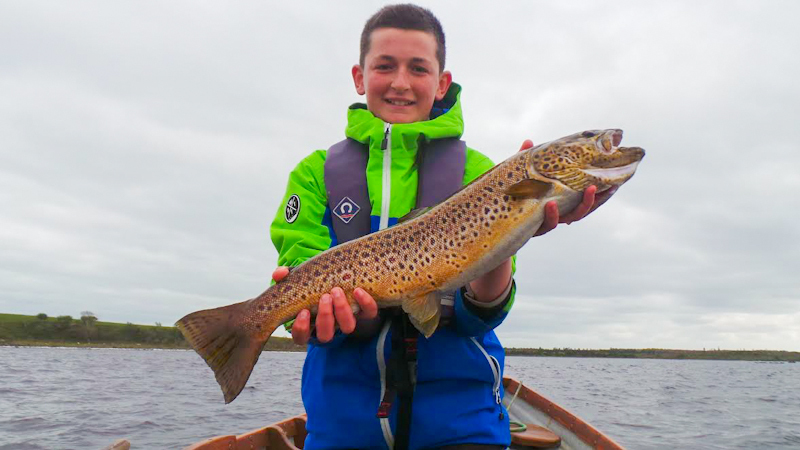 Ronan Cusack reports that unseasonal weather this week resulted in a mixed report from Lough Mask, with the best of the fishing on calmer days to buzzer and olive patterns in sheltered bays. 14 year old Eliot Thievenaz caught a trout to remember last Wednesday while fishing for a half day on Mask with Philip Comber from the Old Stone Barn. He landed and released a beautiful trout estimated at 8lbs on a Tasmanian Devil off the Ballykyne Rocks. 14 year old Eliot Thievenaz with the catch of a young lifetime - a fine trout of approx. 8lbs from Lough Mask while fishing with Philip Comber. The magnificent fish was sportingly released again. Well done Eliot! Declan Gibbons reports on a week of mixed fortunes for angles with some good fishing reported in different areas of the lake and consistent olive hatches, with reports of sparse hatches of early mayfly in localised areas. Some notable size trout were caught but in general angling activity was slow. In the Cornamona area the Cornamona & District Anglers held their Wet fly Competition on Sunday last with 30 anglers participating, and 10 anglers accounting for 17 fish for 16.55kgs. 1st place went to Moycullen man Mike Keady with 4 fish for 4.91kgs. 2nd place went to Mike's boat partner and Cornamona man Tom Doc Sullivan with 4 fish for 4.11kgs. 3rd place went to Oughterard man Martin Butler with 2 fish for 2.84kgs. The heaviest fish went to the winner Mike Keady with a fish of 1.76kgs. Staying in the Cornamona area Richard Molloy of Ballard Shore Boat Hire & Self Catering (087-2879339) reports a quieter week gone by and tells us that TJ Carroll from Westport enjoyed a day's fishing on Thursday last with his best fish being 2.5lbs, taken on wetfly. Larry McCarthy (www.corribangling.com) of Corrib View Lodge, Glencorrib reports a mixture of good and bad fishing days due to temperature changes. Larry guided Malcom Patrick from the UK for 6 days and they had 22 trout to the boat, some on buzzer and the majority on dry olives, last Saturday and Sunday being the best days accounting for 15 trout, all on size 14 dry olives. Pat Gallagher from Meath also stayed at the lodge and on Thursday last enjoyed a good day's sport on deep buzzer, landing 4 fish with an average of 3lbs. Also in the Greenfields area Loughrea father and son Robert & Ciaran Reilly had 3 fish to the boat on Sunday last. The Headford & Corrib Anglers hosted the Andrew Egan Memorial Cup with 9 anglers participating on Sunday last. Conditions were tough and the angling was also challenging in the area with only 2 fish weighed in. 1st place went to Paul Lambert from Cross with 1 fish for 0.94kg, and 2nd place went to club chairman Ignatius Egan, son of the late Andrew Egan with 1 fish for 0.92kg. Ted Wherry from Mayfly Lodge, Ballynalty Bay (087-4305957) reports good olive hatches in the area with fishing challenging at times. On Thursday last Ted guided Richard Robinson who landed 2 fish of 2lbs and 3.7lbs on dry olives. 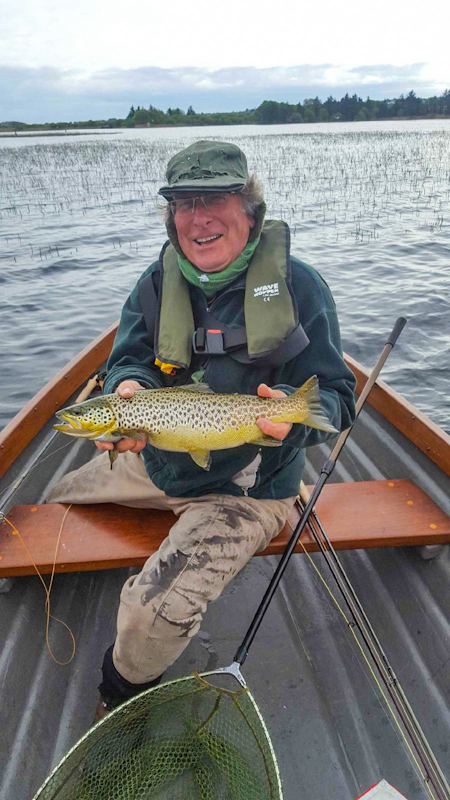 Malcolm Patrick with another fine trout from Corrib while fishing with Larry McCarthy. In the Oughterard area Basil Shields of Ardnasillagh Lodge (091-552550) reports some excellent fish being caught, primarily on buzzer for the week gone by. Pat Connor had 4 fish on buzzer for just over 20lbs. On Friday last Peter Boyle had 2 fish for 9lbs. Steven McGarvey had one excellent fish on buzzer on Saturday of 8.9lbs! Bill Church also had a superb fish on Sunday last of 7lbs; also on Sunday Steve Sutton had one fish for 3.5lbs and Martin Church had 2 fish with the best being 3.25lbs. On Tuesday last Derek Rooney had 3 fish with the best fish 3.5lbs. In the Cong area David Ryan from Ryans River Lodge B&B Fishing & Shooting (info@ryansriverlodge.com or 086-3170081) was on to us to report an excellent fish of 19lbs 1oz which he caught trolling and sportingly released on Sunday evening last. Philip Comber from Old Stone Barn self catering ( 086-2786301) recently enjoyed 2 evenings dry buzzer fishing and had 2 each evening with the best fish 3.5lbs all sportingly returned. 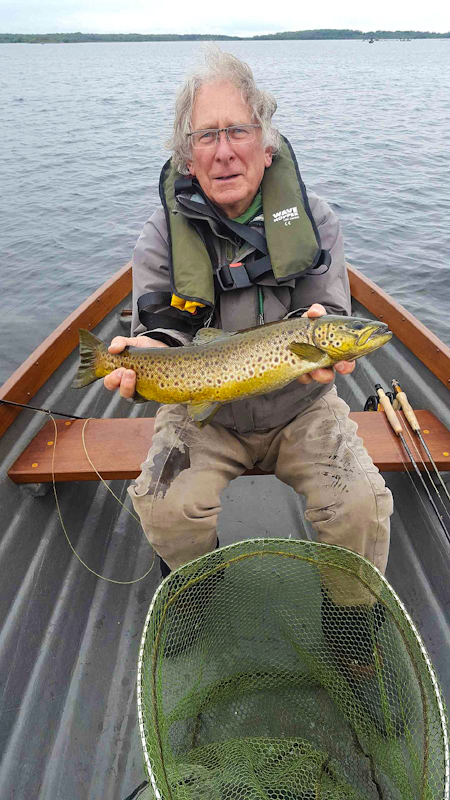 In the Annaghdown area on Saturday last anglers John Trench, Galway and Billy Kavanagh, Cork enjoyed a day's fishing and had 3 trout to the boat on buzzer in the area. Also on Sunday last Padraig Fahy and Patrick Molloy enjoyed a good day's fishing with 5 fish to the boat and Padraig landing a super fish of 6.5lbs. 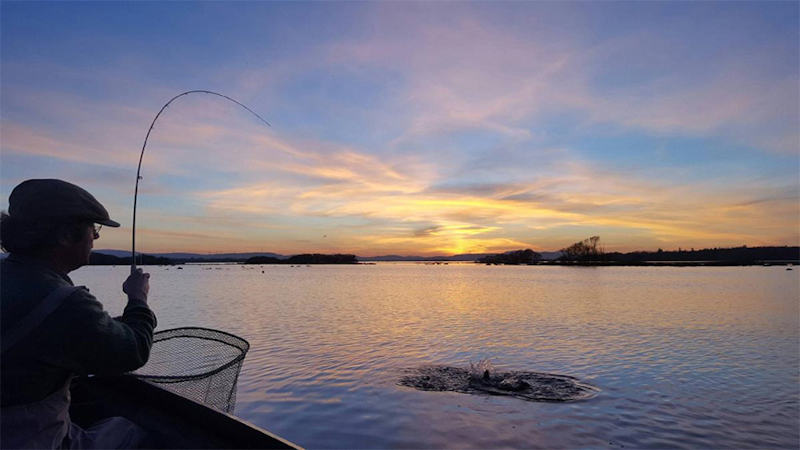 On Sunday next the 30th of April The Cornamona & District Anglers will be hosting The Annual Charity Catch & Release Competition, with the all the proceeds going to a local worthy charity - Galway Hospice. For further details contact club secretary Eamon Gavin on 087-7785713.